Mayday, Mayday! Another blown save by a Dodgers closer in their most recent loss to the St. Louis Cardinals. In an already tight National League race, every pitch and every run will determine who advances to the postseason. Two bad pitches in the ninth inning led to the Dodger’s demise. We experienced a rendition of the Home-Run Derby, watching moonshots come off the bats of Cardinals sluggers Jedd Gyorko and Matt Carpenter. The Dodger’s have now blown 23 games, the second-most in the Major Leagues. Whether they need to hire a psychologist or just come in better prepared, changes must be made. Manager Dave Roberts has to find consistency out of his bullpen. Players that can command and locate their pitches. They currently sit two games back from the second wild-card spot. They are fighting their hearts out among the likes of the Rockies and Cardinals. Dodgers have been trudging through the month of August, only winning eight of 18 games. Game two is underway of the series between the Cardinals and Dodgers. Here is my preview and prediction. In the opposing tonight, the St. Louis Cardinals will send out right-handed pitcher Daniel Poncedeleon. It’s been since July 23rd since his magical start where he went he pitched a no-hitter through seven innings. Preceding that, baseball fans were left wondering if Poncedeleon would ever return after undergoing emergency brain surgery caused by a line-drive. He now returns for his second start this season, sucking up essential innings for an injury-ravaged Cardinals rotation. Cardinals are without starting pitchers Michael Wacha, Adam Wainwright, and Carlos Martinez, so gaining meaningful innings is vital. Since his last start, Poncedeleon has been utilized out of the bullpen, winning in every appearance. Sticking to his core pitching fundamentals will be key for tonight. Working his 94-95 mph fastball around the zone and inducing flyballs is the blueprint. Any juicy meatballs down the middle will lead to souvenir city in Los Angeles. Poncedeleon has only pitched 17 2/3 innings this season, producing a 2.04 ERA and a 0.96 WHIP. 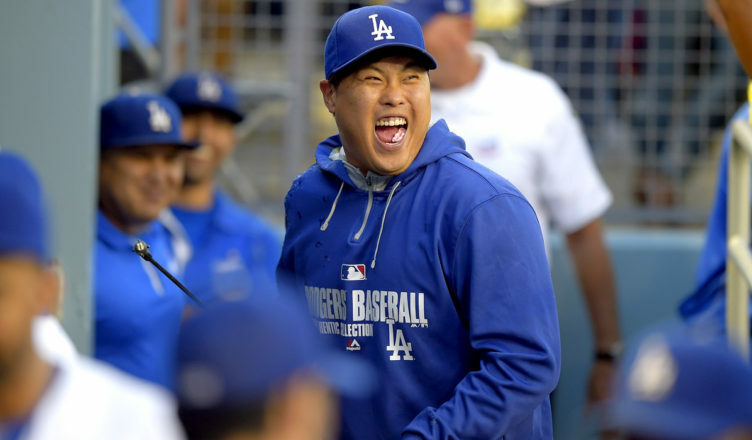 The Los Angeles Dodgers send out left-hander Hyun-Jin Ryu, another player fighting through adversity. He returned Wednesday to the rotation and gave up three hits over six scoreless innings over the San Francisco Giants. He’s relied primarily on two pitches: four-seam fastball (91mph) and cutter (88mph). Ryu generates a high number of swings and misses compared to other pitcher’s four seamers. Ryu’s had the Cardinals number though, producing a 1.50 ERA over 24 innings. However, the Cardinals are ROLLING, winning 12 of their past 15 games. The home-town fans will create an electric stadium tonight for the Dodgers. Both the fans and players know each division game carries major weight. Every at-bat is magnified and every pitch counts. Poncedeleon will throw a solid six innings to keep the game close. Bullpen will open up the floodgates for the Dodger’s offensive behemoths. Machado or Muncy will be an impact player tonight. We’re favored – 8.5 runs. We win 4.5 to 4. How do you score a half run? …….if the batter fails to hit the ball and reaches the fourth post, a half rounder (or run) is scored ……..
You gotta know the rules True…..